Attached character gains the Servitor subtype. Fun card for Lunatic decks, I like that there is a secondary effect so it's not useless against opponents who are immune to insanity. One miss is that you need someone else to wear it. It would be great if it said "Does not get destroyed if attached character goes insane." That would be very thematic, for a servitor of Hastur to clutch their tattered cloak ever tighter as they succumb to madness. I think I'd want to throw this on a character without terror icons, maybe out of faction, since they likely wouldn't be a Lunatic, and pair with Moonbound Byakhee for the icon bump. If there was a benefit from gaining the Servitor subtype, that would be good and add something. Otherwise, I would want to be mean by attaching this to a character my opponent controls that can't go insane (and ideally with Toughness/Invulnerability), so it is harder for them to remove it, unlike the chance they use character removal when it is attached to one of your characters. 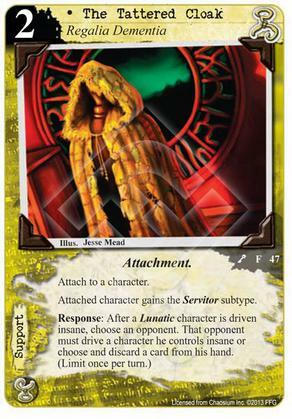 Such an iconic part of Hastur, yet it's never made the cut in any of my decks and I play lunatics all the time. I think the subtype needed to be more effective (lunatic or cultist), provide a different passive altogether, or cost 1. As it stands, it's just too expensive for my tastes, though I like NuFenix's ideas to make the most of it. As with many Hastur cards that don't see much use, I may revisit this after the deluxe expansion comes out, likely in a mono-Hastur draw/discard deck focused on lunatics, Treme and The Greatest Fear.